The following is from a feedback form taken from a high school student, about 8 weeks after his first neck correction in the fall of 2015. The student was diagnosed by his neurologist as having post-concussion syndrome. He was experiencing problems with memory, mood, anxiety, and brain fog as a result of his accidents. After one year of not seeing much improvement in these symptoms, his mother found my practice after reading this article: Concussion as a neck problem, not just a head problem? Why you need a second opinion for your post-concussion syndrome. That’s about half of a school year impacted by his symptoms! Not good. Ideally, he would have been referred by his doctor to a chiropractor like me – someone who works with misalignment in the neck that can create post-concussion-like symptoms. Unfortunately, this information is not yet in front of most physicians. And unfortunately for many people, any option not presented by their physician is an option that doesn’t exist. But, we’re working on it. So, how did he do? There’s still a long road ahead of him. Clearly his brain was impacted by his accidents, as well as his neck. But with the neck correction we saw a decrease in the pressure at the base of the skull, and therefor the base of the brain, and this has helped him get positive changes he didn’t see until experiencing the gentle neck procedure we use. How would you describe your health before you began receiving your spinal corrections? Well, I was a mess. I always fell down. No energy. Back ache. Neck ache. Also my memory was bad. What is it that you heard or read that made you decide to choose my office for chiropractic care? Were you somewhat skeptical? You made it make sense. And it has helped so far. 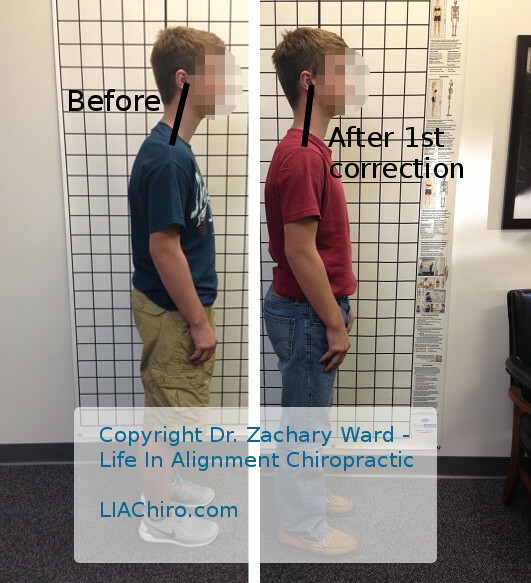 What are benefits that you’ve noticed since you’ve begun upper cervical chiropractic care? 1. I stand up much taller and better. 2. My memory loss has gone away little by little. 3. I also have much less anxiety and fogginess. Thanks so much for this. Read more about concussion and football with the latest article: Why I won’t let my sons play football. If you’d like to consult with Dr. Zachary Ward regarding your post-concussion symptoms, or those of your child, please contact the office at (248) 598-4002.